BoyRaket.com: The Wonders of Malunggay in a Capsule! 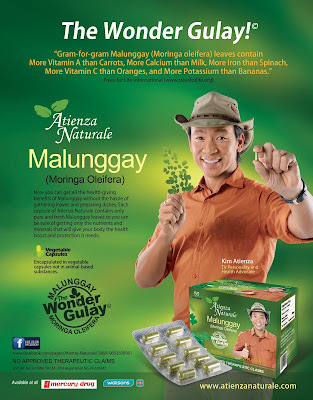 Malunggay leaves are great sources of Vitamin A, B-Vitamins and minerals such as calcium and iron. What’s more, the leaves are also rich in sulfur-containing amino acids methionine and cystine. Malunggay is widely considered a “wonder vegetable” because of its immense nutritional value. It helps promote good eyesight and digestion. It may also provide help in cases of scurvy, asthma, earache and headaches. And due to its exceptional calcium content, it is consumed by lactating mothers to produce more milk to feed their babies. That’s why Malunggay is referred to as “Mother’s Best Friend”. 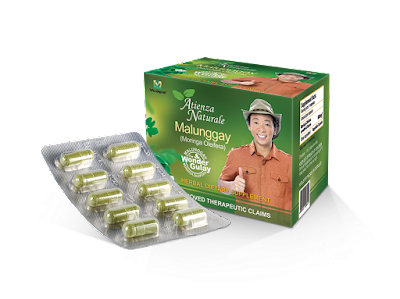 Each capsule of Atienza Naturale Malunggay Capsule contains Vitamins, Iron, Calcium and Antioxidants. Its leaves are good sources of iron, calcium, ascorbic acid and phosphorus. Malunggay is an anti-tumor plant rich in very potent antioxidants which may help prevent the onset of various chronic diseases like arthritis, cancer and heart and kidney diseases. Avaialble at all Mercury Drugstores and other leading drugstores nationwide.